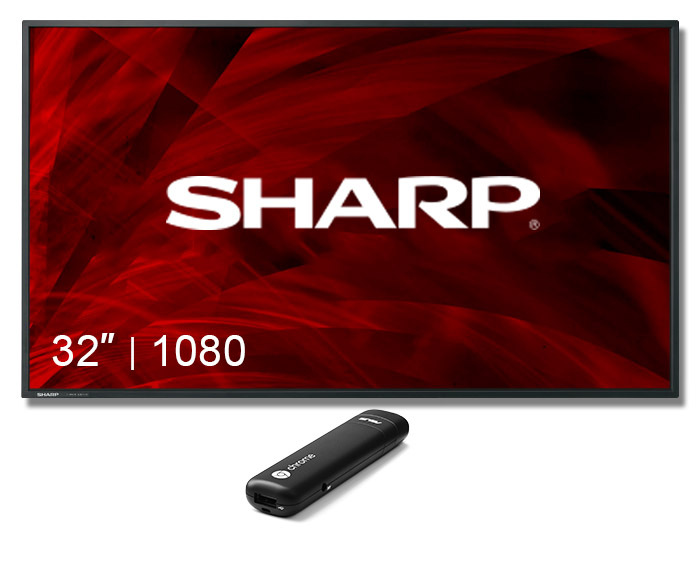 The 32″ Professional LED Monitor from Sharp is designed for ease of use and flexibility in a variety of settings. It has the functionality to support easy content distribution for digital signage. Whether in retail, public, or office setting, designed for prolonged 24/7 display application. So, if you’re seeking a multifaceted signage solution with around-the-clock reliability and easy content distribution, the slimline monitors offer good value. Everything from thin lines to text to photographic images can be displayed in good clarity. A narrow bezel keeps the emphasis on onscreen content, so that information is conveyed clearly.The built-in daisy chain capability via the DVI-D video connection allows up to 5 units to be connected together for the same content. The simple design matches a variety of locations and business settings, from small shops to large corporations and industrial environments. Whether in a landscape or portrait orientation, the monitor can be installed face up, face down, or tilted forward or backward at an angle of up to 90°. Such flexibility helps you to incorporate the monitor into a variety of settings. It supports easy daily usage and versatile content distribution.